A garage is a valuable space that too often is wasted with clutter. Many homeowners use a garage as a dumping ground for things that don’t belong — or don’t fit — inside. Come up With Goals: Before you get started, decide what you want to accomplish. For example, do you want to create enough space that you can park two cars inside the garage? Are you looking to get rid of some large items that have been taking up space for too long? Do you want to create better storage structures, such as bins or even cabinets? Decide what you want to accomplish, and then use that as your guiding light. Set Aside Time: The amount of time needed really depends on the condition of your garage. It might take a morning. It might take a day. It might take a full weekend. Assess the job ahead of you and make sure you set aside enough time to get it done. Also, get some help. This is especially true if you have family members who will need to help you make decisions about certain things. Enlist their help for the project, and you’ll find that things go much faster. Keep, Trash, Donate: Make things as simple as possible when cleaning out a messy garage. Start organizing things into three broad categories — keep, trash, and donate. This will help you be decisive as you work, and you’ll find progress is much easier to come by when you’re using these three simple categories. Create an Intuitive Layout: Once you’ve categorized your things, create a new organizational layout for your garage that makes sense. You’ll want to put the things you use most often in places where you can get to them. You’ll want to minimize the footprint of things you don’t use that often. Buy Storage at the End: Don’t buy storage before you start organizing a messy garage. Wait until you know what you’re keeping and until you have created a new layout. This will help you secure storage boxes or bins that actually fit what you’re keeping and where it’s going to the new layout. Consider Cabinets: You may find that the installation of cabinets is a good idea for your garage. Many homes lack the needed built-in space to properly organize and store everything that needs to go inside. Cabinets can be a garage enhancer. At Ole and Lena’s, we are your go-to garage experts. Follow these garage cleaning tips, and call on us if you ever want to further enhance your garage through replacement, repair or maintenance of a garage door and opener. 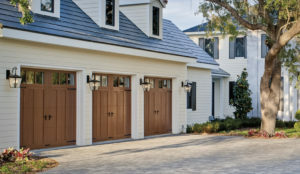 Contact us today to learn about all our garage door services and products.